Cod is one fish I really like because it's not too delicate and really holds it's shape when cooking. Rather than resorting to the popular beer batter cod recipes that originally came to mind, I opted for a lighter, healthier preparation of baking it. The recipe calls for baking leeks in the oven until softened, tossed with fresh tomatoes and then topping with seasoned cod fillets before baking once again. Given it was a gorgeous, sunny day today, this was the perfect dinner to enjoy. 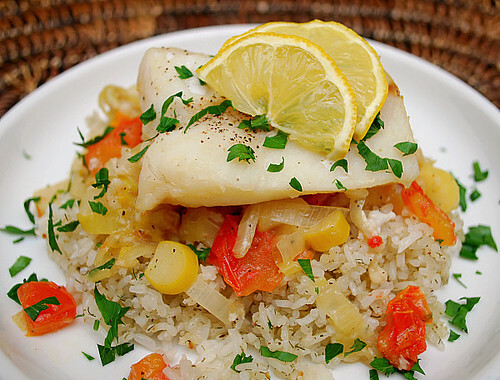 It was especially delicious with the Lemony Dill Rice (recipe follows) I prepared to serve along side of the fish. Preheat oven to 450 degrees. In a 9-by-13-inch baking dish, toss together leeks, lemon juice, oil, lemon zest, thyme, 1/2 teaspoon salt, and 1/4 teaspoon pepper. Cover with foil, and bake until leeks just begin to soften, 8 to 10 minutes. Remove baking dish from oven. Add tomatoes, and toss to combine. Season both sides of cod fillets with 1/2 teaspoon salt and 1/4 teaspoon pepper; place on top of vegetables. Cover dish and bake until fish is opaque throughout, about 15 to 20 minutes. Serve immediately. Heat half the butter or oil over medium-high heat in a large non-stick skillet; when the butter foam subsides or the oil is hot, spoon in the cooked rice, tossing and stirring. Season with salt to taste, lots of pepper, the garlic, dill and most of the lemon juice. Cook, stirring frequently, for about 5 minutes, or until hot. Stir in the remaining butter or oil and cook for 1 minute. Remove the rice from the pan to a platter, add the remaining lemon juice and serve, with lemon quarters. I like the entire dish - refreshingly delicious.